for a quick look at the Milky Way. 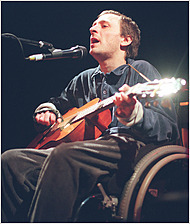 Singer and Songwriter Dies at 45: Vic Chesnutt, whose darkly comic songs about mortality, vulnerability and life’s simple joys made him a favorite of critics and fellow musicians, died Friday in a hospital in Athens, Ga., a family spokesman said. He was 45 and lived in Athens. He had been in a coma after taking an overdose of muscle relaxants earlier this week.